Home » We’re hiring, but don’t you dare call our managers! Nick – I’ve been involved personally with the networking method you outline above since the late 1970s, and professionally since 2001. 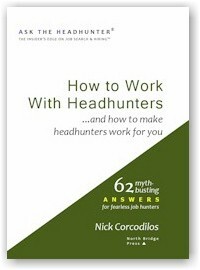 I own your book (Ask the Headhunter), and have been following you on-line for a long time (and I mean long). I’m saying all that to say this: there is a book that was published in 2016 that is perhaps the best I’ve ever seen on how to conduct an effective and productive networking meeting (or if you will, an informational interview) — The 20-Minute Networking Meeting – Professional Edition by Perez and Ballinger. 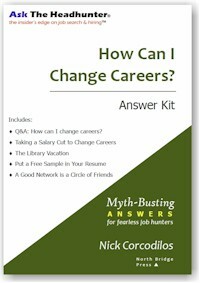 For any of your readers who want to go deeper into what you discuss above, and / or who want to discover how to get around our broken “hiring system” and develop job leads and opportunities without blindly applying on-line, trying to beat the ATS, or dealing with the hurdles the typical HR department puts in front of us, I strongly recommend this book. Sage counsel here, Nick, as always. You’ve previously covered the notion of rejecting potential employers based on their approach/attitude towards hiring practices, but it clearly bears repeating. 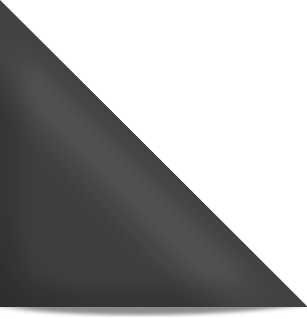 Your reader articulately recounts previous experience as a hiring manager. What was true back in 1996 is still true today: If a hiring manager is unable to devote a certain percentage of their daily workload to sourcing great talent — whether by proactively recruiting, fielding direct inquiries, or through other techniques — it suggests a fundamental flaw within the organization of which a job hunter should take serious note: Is this really the kind of place where you’d want to work? @Garp: My suggestion to all managers is, if you’re not spending at least 20% of each week recruiting, get with it because you’re not managing. Getting the work done is all about having good employees, and finding and hiring them is one of the manager’s key jobs. We never posted on job boards, just on our internal job site. We still got tons of resumes. Mostly useless, and my boss, the official hiring manager, didn’t look at them until it was too late. I hired using my connections. How do you identify the hirng manager anyway? Putting that info on the job post is crazy, and the job might be in another manager’s organization. Phone calls in response to an ad might be from eager beavers – or from aggressive jerks. But phone calls from people following your advice are always worthwhile. Those candidates can find out about the job before it is posted, and can get you directed to the right manager. Your paragraph “Don’t Break he Rules” maybe should be on top. That’s the way to be first in line for a job. That’s insane. I wouldn’t be that desperate to work for a paranoid schizophrenic – and if they’re trying to present themselves as a desirable place to work, then yes, they are being schizophrenic. Totally agree, Nick, with the four conclusions. It saves a lot of wasted time and energy for the applicant. Also, just heard during the last week that open positions per the national stats are at 7mm – up from +6mm. Wonder who dreamed that up?? Apparently, someone decided the +6mm stat was becoming really, really stale-dated. @Marilyn: The increase in jobs posted is probably the result of stale jobs. Those are the filled or canceled jobs that the job boards never remove. To begin with … just because a company advertises, that doesn’t mean there’s actually a job available. We all know that. With that said, if I see an advertised position that I would love at a company where I would love to work, I’m not going to waste my time applying through the ATS. Instead I’ll do some research and find out whom the likely hiring manager is. Then I’ll try to figure out some way to meet that person, or perhaps someone who works for that person or someone I know who knows that person. A personal contact beats a piece of paper any day. My goal is to be the person the hiring manager is talking to on the phone while HR dumps another inch of keyword-matching resumes on their desk. Only if I have absolutely no way of meeting the hiring manager any other way will I write directly to the hiring manager. I have no qualms about bypassing HR, and I don’t think the hiring manager will mind if I do. As long as I’m polite, professional, and to the point, what’s the worst that can happen? I’ll get rejected. I’d rather get rejected by a person than by a computer. A person might think of me next time. @Steven: Good for you. But consider this. When you use any method whatsoever to apply for a job that’s already on a job board, the baseline odds you’ll even get an interview are tiny — simply because your competition is staggering. The employer has broadcast the job through kingdom come, and every recruiter is amplifying your competition by driving tons of junk candidates at the position. Since you’re already doing the wise thing and going to the source of the job, try doing the same, but before a job becomes public. Exploit your contacts to identify positions in good companies before they’re posted. Increase your baseline odds of success by cutting out the competition altogether. And you’re right — no matter what, a person might think of you next time! 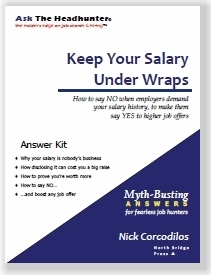 Nick – You say, “… try (going to the source of the job), but before a job becomes public.” This is the key to success, the way to bypass (or eliminate) the competition, and what networking and informational interviewing is all about. Thank you for, and continue beating, this drum — it works! For many jobs and in many industries I have no doubt that’s true. But for highly specialized jobs, or for jobs where demand far outstrips supply, a job advertisement may prove fruitful. Nevertheless, I agree that there’s nothing better than meeting people. There are so many posted jobs that do not exist. I blame crappy run companies that post jobs for legal reasons and then forget to remove the post. For example, I saw job posting at one of the largest banks operating in the USA. I have a good contact inside and asked them about the job and was told the manager of the group had just put in his resignation so the job would be on hold. Long story short, they shifted the job to another group and have never filled it. Every once in a while I look through job postings and I still see that job posted, now six years later. All of the resumes and messages for the manager position and those under the manager are sent to a group that no longer exists and as I understand it, no one is checking these messages. I have been consulting for a long time but companies are getting worse, critical tasks are missed on a routine basis and these companies refuse to hire an appropriate number of employees. Investing time in hiring the right candidates means many headaches saved later. And I agree that candidates need to reach out. I once overlooked a candidate on paper (resume), who later reached out through a referral to ask for a chance to interview. I was impressed with her assertiveness, and she turned out to be a great fit for the team. She was hired and is still with the company 6 years later. Sage council, yes, but I fear it has become increasingly unrealistic. The financial and other industries I deal with are growing increasingly concerned with government and industry regulation; violations can result in fines or even imprisonment of key executives. I’m not sure if there are formal requirements, government of ISO, but HR seems to have completely hijacked the agenda in all the firms I’ve been dealing with, past clients and prospects. On the one hand, as an independent contractor I can’t complete with the Big 4 or other large agencies who can deal with masses of paperwork now required. As an individual, be it applying for a contract (managers *used* to hire me directly) or full employment, managers are *NOW* telling me directly that they can’t deal with me, that I *have* to go through HR and apply for a posted position and that they *have* to write a ‘job description’ and submit it to HR. The managers don’t like this process any more than I do. It was one of them that came up with the phrase that “HR has hijacked that hiring process”. Compliance, perhaps, but there is a ‘seen to be done’ as well, no ‘nepotism’ or ‘cronyism’. It used to be that the most reliable way to hire was by personal recommendation, often of people that current team had worked with in the past. Certainly I found a lot of work that way. But this approach requires that the manager is in control of the early stages of the hiring process, and HR has “hijacked’ that. I suppose that HR’s view is that they can’t tell this from ‘cronyism’. Do you see what is going on here? HR immediately hijacks the process. No, really; for example, any competent programmer knows a few languages and a good designer will have a lot of other interests as well. This is becoming all too common. Post a job, solicit people to apply, ghost them (don’t reply or acknowledge them at all), then have a fit if they dare to follow up re the status of the job and their application. A local company has posted a number of jobs online, and directs people to apply for those jobs through LI, with explicit instructions NOT to contact the company, HR, or the manager. I had found a job there I thought I’d like, and instead reached out to a fellow college alumna to try to suss out the company, the manager, what it is like to work there. She has been there for some time, and never had to go through LI (when she got hired, she applied directly to then-hiring manager, what a concept). She did tell me (after asking around) that the company now has anyone who wants to work there apply through LI so LI can do the screening for them. Only when LI submits a list of candidates will they decide who to phone screen and interview. WTF indeed. She said it is a good place to work, but I’ve written them off if they’re not making use of personal contacts and are letting LI do their recruiting and screening. Many companies have been dysfunctional for way TOO long to know what real hiring involves anymore. That’s exactly one way I’d attempt to make contact. Purposely putting up obstacles such as ATS and other garbage only proves that working there is likely to be a daily grind you don’t want to endure. Effectively, it’s the “closed door” policy foisted on applicants before they even get hired. What other evidence are you waiting for? Either they welcome those that take initiative or shun them. Good luck getting face-to-face time with a “manager” even when employed at these companies. RUN, don’t just walk away from this drama. However, if you insist on navigating this type of control freak “hiring” maze, then don’t be surprised when you get fired via email…or even text. I live in Europe and I find the system to be exactly the same throughout Western society. I recently found a contact that works at a company I was really interested in, took a lot of time to research it, wrote a cover letter detailing what I have done and how I could contribute etc. My contact then told me the only way for him to refer me was to hand my application into HR. As there were no positions that suited me at that time, I produced a “speculative application” indicating the department I was more interested in but letting them know that I would be open to other positions they thought would suit my skills and background – I really wanted to be part of the organisation and thought that once I got a foot in the door, I could move to a more suitable position. My contact indicated that as well but was told he had to recommend me “for the closest position” as they don’t accept “generic applications”. LOL. My main purpose was to have an informational interview where I could not only see how they actually work but also show them how I could profit the company. Needless to say, the position my contact was forced to recommend me for was not suited for me, and HR sent me a no-reply email in which “they regretted to inform me” blah, BUT they were still interested in my skills and background and “encouraged me to apply for other positions” that become available. They didn’t even make the effort of keeping my CV on file and contact me in the future OR get an actual person to reply that I could contact. I find this very disrespectful. To add insult to injury, a couple of days later I received an automated message from their ATI where they asked me for feedback about my interview…! It goes without saying that I have written them off. I have seen a couple of positions that would be suitable now, but why would I go through all this again, only to be rejected by a bunch of kids behind an even stupider machine who are too lazy to even write a personalised message? Job seekers are regularly ABUSED by jerks and I wonder when that will be addressed. Yeah, I know. Never. @MC: Does this make you wonder what the board of directors might say if it knew how this company’s HR department squanders personal referrals from employees? It’s not just job seekers that are abused by this embarrassing, inept HR behavior. The company and its investors lose, too. MC — you state, “My contact then told me the only way for him to refer me was to hand my application into HR.” As soon as you did this (your speculative application) you were dead, as you quickly discovered; you were immediately seen as just one more job applicant, one more piece of paper in a very large pile of paper, one more cog on a giant wheel. Had you followed a networking-plus-informational-interviewing approach with this employer you would have stood a much better chance of bypassing HR, meeting with the hiring manager, and working there today. For your next attempt, let me recommend four books in the order shown: What Color is Your Parachute? ; Cracking the Hidden Job Market; Smart Networking (Lynch); The 20-Minute Networking Meeting – Professional Edition. 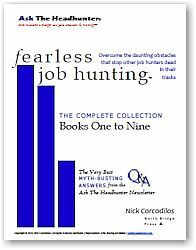 And if you haven’t done so already, become very familiar with this site and Nick’s recommendations for making inroads into career fields and into potential employers. Thanks for your response and recommendation – I’ll check these books out. I had been trying to get a decent contact in that organisation for ages and I jumped at the opportunity to be referred by this guy – he also holds a fairly high position there, so I assumed he would have been listened to. This was the only way I found to be in touch with them and although I’ll admit I have been naive in my job search up until now (Nick’s blog is saving me :) ), I swear I tried all of the other possible channels. Managers were not really involved and as this article points out, this is not a good sign. It’s also worth noting that my application and request for an informational interview was reviewed by humans and bypassed the infernal ATS but of course it went through HR and I have to agree that sadly these useless clowns are responsible for screwing the recruiting process. Nevertheless, they still sent their response through a machine and even a follow up for an interview that never took place, which I find particularly insulting, so maybe it’s for the best that I didn’t end up working there. @MC: This points out the real problem. HR’s mismanagement is just a symptom. The real problem is managers and employees who follow silly rules. As a headhunter, I’ve had many client companies with iron-clad rules: NO INTERVIEWS UNLESS HR CONTROLS THE PROCESS! I work with such companies only when managers ignore HR, conduct the interviews, instruct HR to issue an offer anyway, and then hand-walk that job offer through the internal process quickly so the candidate can be hired. HR squawks. So what? In the end, a good manager gets the hire. The other problem here is that the guy who referred you failed. He should have scheduled an off-site lunch for you and the hiring manager and let the manager pay for it. HR should have been brought in only after the manager decided you were a viable candidate — though the manager would still have had to shepherd the process personally. Couldn’t agree more I have pretty much decided never ever to apply for a job in Linkedin or any generic job/company portal unless I can contact the hiring manager first. It is a total waste of time. I work in a specialist area and I am quite senior so I know more or less how many applicants there are with my skillset. I have applied for jobs in linkedin maybe a dozen times or so through the last 5 years and maybe another 10 or so times in company’s own portals – mostly to see if the system was still as terrible as before. It doesn’t sound like a lot but these are places where I know I am the best candidate sometimes the only candidate that fills both what they actually need and what they think they need. These are jobs were if I could talk to the actual hiring manager they would hire me on the spot. The result – out of the twenty I got two acknowledgements that they were reading my application, nothing for the rest and zero actual replies. That’s it zero, not even rejections. None of them allowed me to contact the hiring manager. What I have seen of late that is even worse is when an “Exec search” posts something on linkedin. The last time I emailed one to arrange a call to ask about a position (I would usually avoid doing this but the position was somewhat interesting and I had not heard of it from my network). Needless to say I got ignored. Now I am a senior exec that does a lot of hiring so I do not get ignored often. So I naturally emailed the poster’s boss. Also ignored. Called their head office and finally a very pissed off headhunter tells me he has no time to deal with losers like me unless we send our CV first. He was looking at my linkedin as he was talking to me but he still gets my current job title wrong, somehow misses all my connections and is shouting down the phone at a very senior exec telling him just to dumbly submit his CV and wait for a reply like a little lamb. I am calm throughout he is excited and going on a little power trip. Linkedin – useful for checking connections, maybe someone’s background and what contacts you might have in common. For jobs… enough said. Just for amusement my last reply. He has now been blacklisted by a few corporates (I do have a decent network). I usually would not bother but this is someone that was particularly offensive. “I do not know why I am even bothering but you annoyed me enough. You are in a people’s business so you really do not need me to tell you that your behaviour was less than stellar. If you start raising your voice at a potential client and badgering them with your years of experience then you already lost whatever argument you were having. Coming guns blazing at me and saying it was my fault would be entirely inappropriate even of you were right (which you weren’t). Getting my job title wrong was offensive as well, I hope it was deliberate because if it was done in ignorance it’s somehow worse. A Director of Treasury/Group Treasurer usually reports to a Group CFO a head of Treasury rarely does. The first title tends to be a lot more senior than the second. If 25 years of experience haven’t taught you that then you have no clue what a Corporate Treasurer in the UK does. Also, I contacted **** twice. Even if the first time he had missed my message the second time he shouldn’t have. It takes me 5 seconds to determine how senior/relevant someone is. This is the entirety of your job you should be even quicker than that. In fact, you should know all the movers and shakers already. I do. And, if someone is really senior but going for the wrong role then you call them very nicely convince them the role is not for them and arrange at catch-up at a later date. After all, they are always a potential client both as a hirer and an hiree. This is what Korn Ferry does, this what Spencer Stuart, Marlin Hawk, etc…do. If you want to play the big Exec search game then smarten up. I’m generously giving you advice for free. PMadeira – what you are describing is more or less what happened to me except that I didn’t have to endure some self-entitled jerk shouting at me. Sometimes it doesn’t matter how senior you are or how hard you try to talk to the managers, their system just won’t allow you. Sometimes you report them but no one really cares. What really bothers me is this new, appaling culture of “ghosting” that has become acceptable in every aspect of our lives. Professionally, this is one of the worst sins and emotionally, it really upsets people. Because it’s people we are talking about but everyone seems to forget it. This is another side of networks. Good for you for putting out the word and for delivering the tongue-lashing. This clown deserves it because his job has gone to his head: He thinks he “controls” jobs. The failure of his boss to respond to you says it all.